Terminal 4 of Singapore Changi Airport officially opened back in August last year and even though it has already been almost half a year, I have not had the opportunity to check it out until a couple of weeks ago when I was traveling on Vietnam Airlines. There are only two airport lounges here in Terminal 4 and one is the flagship Cathay Pacific Lounge (which I will have to visit at some point) and the other is the Blossom – SATS & Plaza Premium Lounge (commonly known as Blossom Lounge which is incorrect). Click HERE to purchase Lounge Access for an upcoming trip! There are various ways to access Blossom – SATS & Plaza Premium Lounge here in Terminal 4 of Singapore Changi Airport. If you have already seen my list of credit cards to hold this year, you will be able to access this beautiful space for free. The Priority Pass membership that you can easily get with selected credit cards will allow you to access this airport lounge alongside one guest. Alternatively, if you hold the OCBC VOYAGE Card or the American Express Platinum Card, you will get to enjoy unlimited access into all Plaza Premium Lounges (like this one!) - you will also be able to take someone in with you for free. Located on Level 2M of the Departure Transit Area, Blossom – SATS & Plaza Premium Lounge is open 24/7 and it occupies a rather large area that caters to travellers with different needs. Towards the end of the lounge is where you will find semi-private seats that designed for the solo-traveller in mind - you will find a power socket and USB port under the armrest (which also doubles as a small coffee table). While I did not bother with these seats this time (I was on holiday after all! ), I can definitely see the appeal if I were traveling alone. Since I was traveling on Vietnam Airlines in Business Class (which will be an interesting trip report to write once I have organised the photos), I accessed the lounge using my boarding pass. The first thing you will notice as you walk into the lounge is how modern and new everything looks (and they are!). The dining room will most likely be the first designated area that you will notice and there are plenty of tables here for you to sit on. I visited the lounge at approximately 10:30AM and it was fairly empty (probably less than 10% occupied) so I could pick from a wide range of tables. 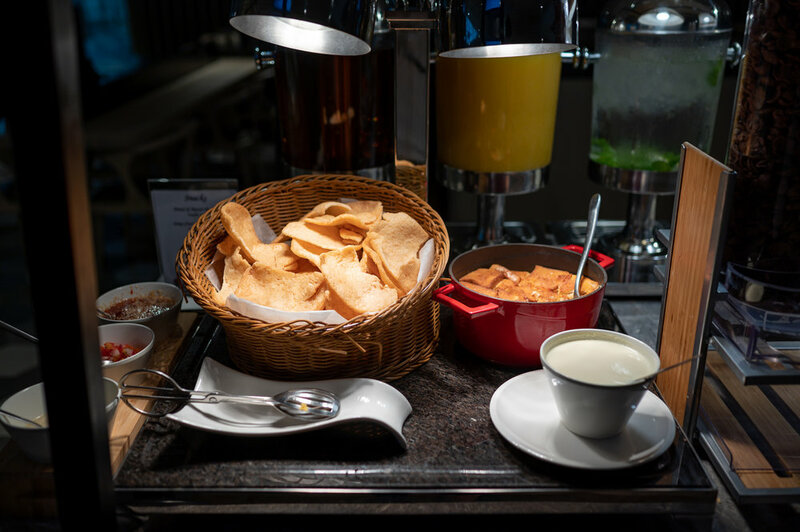 Consistent to my previous experiences with other Plaza Premium Lounges that I have visited recently, cooked food is offered here in Blossom – SATS & Plaza Premium Lounge. During my visit, I had a choice between a bowl of Singapore Laksa or Vegetarian Noodles so no points for guessing which one I went with on that visit. Affectionately-known as SATS Laksa (since SATS caters this to most, if not all airport lounges here in Changi Airport) amongst the locals, the laksa was every bit as satisfying as it looks. Condiments can also be added as you desire so feel free to hold back on the additional chilli if you are not up for something spicy that early in the morning. If you are craving for something a little lighter or healthier, there is even a decent salad station located near the entrance of the dining area. I really enjoyed the warm prawn crackers too which were placed directly behind the juice and cordial station. For an independent lounge, I dare say that the food here at Blossom – SATS & Plaza Premium Lounge is probably one of the best ones that I have sampled in non-airline lounges. There is a decent selection of hot food from the buffet station if you prefer not to have noodles in the morning and I was pleasantly surprised to even find sliced chilli by the side. If you are traveling out of Terminal 4 on a low-cost carrier (there are a few that depart from this terminal), dropping by this lounge is a good idea to fill your tummy up before your flight. Should you be up for an alcoholic beverage, you will be able to find a small selection of spirits and wine here. Honestly, most independent airport lounges that I have been to do not even serve anything alcoholic (other than beer which does not really count) so having a small selection beats having nothing. The ice-cubes were also religiously refilled (always a good thing!) while I was there but the ice bucket on the side of the lounge (more on this later) was neglected. If having a G&T in the morning sounds fairly intense to you, there are other beverages that you can enjoy - all these drinks are complimentary so feel-free to help yourself to them while you are in the lounge. As you may already be aware, The Peranakan Love Story here at Terminal 4 plays every 15 minutes and the best seats in the house are actually located here in this lounge. Unfortunately, there was a sign towards the end that restricts travellers other than Korean Air First Class passengers from entering. While there was no one there to police this admission when I visited, I did not bother to cross the line (in the most literal sense). There is a small link bridge between the main area of the Blossom – SATS & Plaza Premium Lounge and a small area that faces the Cathay Pacific Lounge. Since it was fairly quiet when I visited, this entire area was almost vacant. I really like how big this entire lounge feels and how it spills over to various areas to cater for different types of travellers. There is a bar area (unmanned during my visit) which offers other cocktails and beverages (for a fee) if you would like to enjoy something other than basic spirits. In fact, if you have missed out on the opportunity to try the famous Singapore Sling, you will be able to get it here at the bar for a fee. If you are here on a longer layover and would like to take this opportunity to freshen up, there are shower rooms here and they are free to use if you already have access to the lounge. There is even a sleeping/resting area here in the lounge which I did not manage to check out while I was there but I will definitely attempt to find it on my next visit (unfortunately, I do not have any upcoming flights that depart from Terminal 4). On the whole, Blossom – SATS & Plaza Premium Lounge is probably one of the most impressive independent airport lounges that I have been to in a while. The space is beautiful, polished and extremely comfortable but more importantly, the selection of hot food is decent enough for a proper meal. Now traveling from Terminal 4 to the other terminals in Changi Airport is rather cumbersome so I do not recommend anyone to do it unless you have plenty of time. In fact, if you really have to go to another terminal for whatever reasons, catching a bus outside of the transit area is a lot faster. When I flew out of Noi Bai International Airport (HAN) on Singapore Airlines in Business Class, I had access to Vietnam Airlines Lotus Lounge (sometimes referred to as NASCO Lounge) before departure. Even though Vietnam Airlines is not part of Star Alliance (it is actually part of the SkyTeam Alliance), most of the star alliance partner airlines use this lounge for their premium cabin passengers. Located in the International Departures Terminal above Gate 28, the Vietnam Airlines Lotus Lounge is open from 6:00AM to 2:00AM daily. Having been to the Air New Zealand Auckland International Lounge (which is probably my favourite lounge in AKL) and the Strata Lounge (a Priority Pass lounge), I was curious to check out the Qantas International Business Lounge when I was traveling from Auckland to Melbourne last month. The Qantas Lounge here in Auckland Airport is located airside on level 2 and it opens from 4:00AM until the departure of the last Qantas or Emirates Service so you do not have to worry about accessing it if you are traveling on QF/EK First and Business Class. Located in Terminal 2 of the Shanghai Pudong International Airport (PVG), the No.77 China Eastern Plaza Premium Lounge is the world's first co-branded lounge and it offers 180-degree views of the airport runway. As a Business Class passenger traveling on Singapore Airlines, I had access to the Air China Business Class Lounge but having been to the Air China First Class Lounge in PEK, I was slightly discouraged to check out the Air China lounge so I decided to take my American Express Platinum Card to the No.77 China Eastern Plaza Premium Lounge instead. Since I had to be in Auckland for work and having been there on multiple occasions this year, I decided to spend the weekend in Melbourne instead. Getting from the city to the airport is relatively easy and there are affordable options out there if you are looking to save money. Alternatively, hopping on an Uber should cost you around AUD 55 which is reasonable since it takes you from door-to-door. Now I have already checked out the fairly-unimpressive Qantas International Business Lounge as well as what is perhaps my favourite Emirates Lounge here in Melbourne Airport (MEL) on a few occasions. As such, I decided to give the newly-opened Plaza Premium Lounge a go. Since I had a five hour layover in Melbourne Airport, I decided to check out the American Express Lounge at the Melbourne Airport. There are not too many American Express Lounges in this part of the world so I was fairly excited to check it out (this was my first visit!) after convincing myself to get The Platinum Card a couple of months ago. If you hold a Centurion or Platinum Charge Card from any country, you will be able to access this lounge alongside two guests. Otherwise, please refer to American Express to see which cards are eligible for access. Even though I have visited the Qantas International Business Lounge on multiple occasions over the years, I have not actually spent much time in it until today. As I am booked on a flight to Auckland via Melbourne, I have a ridiculously long layover in the airport and amongst all the airports lounges that I have access to, the Qantas International Business Lounge is the only one with shower facilities. Therefore, I decided to stop by for a quick shower before checking out some of the other lounges. When I flew back from Bangkok last weekend, I took the opportunity to check out the the SilverKris Lounge at Bangkok's Suvarnabhumi Airport (BKK). The Singapore Airlines lounge which opened back in May 2017 is one of the most highly-rated SQ airport lounges in the region so I was actually pretty excited to check it out personally. There is a lack of signage in my opinion so if you are having trouble locating the lounge, it is actually located near to Gate D7. If you have been following me on Instagram, it is no secret that Bali is one of my personal favourite getaways. In fact, I have already been to Bali five times this year and there is no saying what may happen in coming months. In my opinion, the best flights from Ngurah Rai International Airport (DPS) to Singapore Changi Airport (SIN) are operated by Singapore Airlines and KLM - both of these airlines use the Premier Lounge and Garuda Indonesia Lounge respectively for Business Class passengers. I think it is safe to say that the Premier Lounge is perhaps one of the most unimpressive and uninspiring airport lounges that I have ever been to. As such, I was really surprised to find out that the T/G Lounge (which I have been three times now this year) is so much nicer even though it looks fairly uninteresting from the outside.